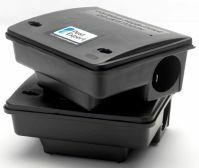 These Rat Bait Stations / Mouse Bait Stations (Twin-Pack) are designed for the safe housing of rat poison / mouse poison. These heavy-duty bait boxes have an auto-locking mechanism making them ideal for use in both indoor and outdoor situations. They have been cleverly designed to encourage rats and mice to enter and feed while protecting the rat and mouse poison from adverse weather conditions and preventing access to children, pets and non-target species.